Kyle Costello lives in Orlando with his wife Alysa and their dog, Ginger. Kyle attended the University of Central Florida and obtained a Bachelor’s Degree in Political Science. Afterwards, he attended Barry University School of Law and graduated in May of 2015. Since then Kyle has practiced solely Civil Litigation matters from inception to trial and appeal. Kyle has also argued before the Florida Second District Court of Appeals. 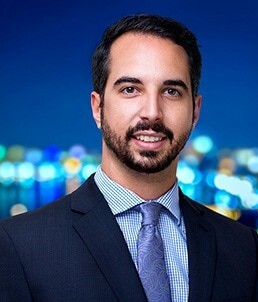 Kyle is currently a member of the Orange County Bar Association and a member of the Florida Bar Young Lawyers Division. In his spare time he loves to attend UCF football games and spend time with his friends and family.